Explore the structural and material design of aircraft and spacecraft from the viewpoint of an aerospace engineer. Prerequisites : Basic knowledge of Physics (concepts of forces and moments, springs and temperature) and some familiarity with aircraft and spacecraft terminology: (e.g. wing, fuselage, tail plane, rocket, launcher). 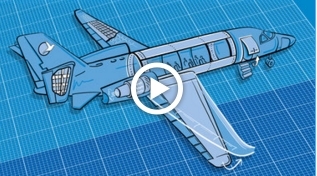 Content : An interesting Mooc in which theoretical concepts of strenght, stiffness, stress of materials and structures of aircraft are explained. The course is nevertheless very theoretic and doesn’t contain many practical examples. A lot of not guided researches by your own are required, especially about the materials used in aircrafts and how to design structural elements. For instance, without any introduction or given links, you’re asked to list the principal materials and their properties of your favorite aircraft or to design a firewall bulkhead for a two-seater sports-aircraft. Personally, I’ve got the impression that I’ve learned more by my own researches than by the Mooc content in itself, an approach which is interesting but very time-consuming and which requires much more investment than announced. Also, the content and the explanations aren’t always very clear, and some formula errors and missing units don’t facilitate the required calculations of values. Discussions: Interesting questions and contributions by the students. More responsiveness by the staff to the numerous questions and remarks would be welcome. Evaluations / Certifications : Different forms of evaluation are available and the given explanations of the evaluation criteria are more than confusing. So, here my personal experience: Each of the 7 chapters finishes with a 10 question multiple choice test (1 to 3 attempts available in function of the question); minimum required is 60% for each test. Only if you are successful in this test, a second assignment to accomplish for each chapter becomes available: mostly a more or less complicated essay to publish in relation to design and material topics; evaluations are either self-evaluations, peer-to-peer evaluations or sometimes pre-defined multiple choice questions. There again, a minimum of 60% of good answers is required. To accomplish successfully the Mooc and to get an EDX-certification (50$), the lower limit is fixed to 85% of success, which doesn’t let a lot of margins of errors or bad peer-to-peer evaluations. My personal overall score was 97%, but it costs me a lot of time- and research-investment. This was the very first session of the Mooc. It’s a Mooc with much potential and is worth to continue, but I hope that the mentioned deficiencies will be corrected.